Hanging over the entrance to the 2009 International Luxury Travel Market swayed an enormous banner proclaiming “Definitely Dubai”. 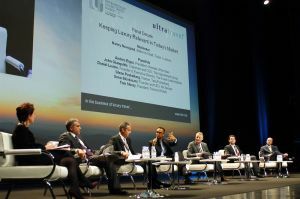 It was just one of the many statements stimulating lively discussion and debate at the annual meeting – this year attended by thousands of luxury travel professionals including over 1,200 suppliers, 214 stand holders, and more than 1,100 international buyers. The floor was busy. The mood upbeat. Dubai particularly epitomises everything about the glitz of what luxury represented in the early nineties. However, at the opening forum a range of senior figures from the industry questioned the definition of luxury in today’s climate and suggested that the concept has felt a backlash in response to the economic crisis. Tom Storey, President of Fairmont Hotels, opined that “luxury is in the eye of the beholder.” What is suitable for one may not be for another. Andrés Ergas, President of Nomads of the Seas, proposed luxury is “about giving people a new dimension, anyone can have a spa at a hotel, real luxury is being helicoptered onto a glacier and having a superb massage submerged in nature. These days, it’s all about creating a memory. There was no doubt that luxury is about exceeding expectations and needs. However it is essential to know what these needs are and these are deemed to have changed. Kristi Jones, President of Virtuoso argues the hotel industry is lagging behind in using technology to gain greater understanding of client requirements. Technology used well can personalise the “wahoo” factor. Use of effective technology within a fully integrated system means you can go that extra mile to ensure future business, “clients expect a seamless experience and technology can fulfil this role,” Jones continued. The next generation of buyers will review, buy and inform about their travel experiences in a very different way. Social networking sites, responsible ethics and population growth will ensure travel purchasing will be driven by different practise and those that respond to these drivers will be successful, ignore them at your peril. Offering special discounts, or products tailored to an individual buyer, is more valuable than the customary champagne on arrival. Personalisation is also particularly relevant to the changing demographics of the luxury traveller. What is popular with Western luxury travellers differs immensely to Chinese and Indian visitors who are anticipated to form an extensive part of the future luxury travel population. Special guest speaker astronaut Dr Buzz Aldrin gave a passionate talk about the potential for space expansion suggesting governments really need to commit to programmes if the world is to be in a position to develop colonies on other planets. Maybe a step too far in the future of luxury travel in the current climate but it came the same week as Richard Branson unveiled Virgin Galactic’s VSS Enterprise in the Mojave Desert. Branson predicts that economies of scale will ensure the opening price will drop enabling larger numbers of thrill seekers to take a flight. The future is perhaps nearer than we think. Unlike last year where the global depression hung a dark spectre over Cannes, this year’s ILTM was more optimistic. Jennifer Fox of IHG said “booking rates are back to normal, even if rates aren’t where we’d like them to be” and Guy Crawford of Jumeirah added “we are at the end of the beginning”, an interesting comment from a business with its main stake in the beleaguered Dubai. 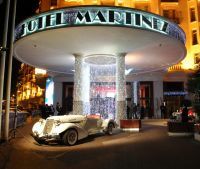 Cannes itself seemed unaware of the client’s search for social values as the ILTM parties were as extravagant as ever, and the hotels as glamorous as always with many undergoing renovation and reforms to satisfy the ever more demanding client. Whilst the Majestic, Carlton and Martinez continue to offer sartorial elegance we chose the funky option and stayed at the uber-cool Hotel 3.14. 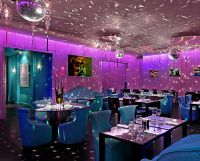 Yes it had sparkle, from the glitter-balls in the public toilets, yes it had opulence in the fabulous crystals hanging from the ceiling and yes it had style, housed in a fabulous art deco building. Four colourful canaries were a talking point behind a mirrored bird house in the jade and purple reception reflecting the sparkly stones in the floor. What it also had was a real sense of fun and humour about it. If as Glenn Pushelberg of hotel design house Yabu Pushelberg suggested hotels are as much about “the feeling they give you,” then Hotel 3.14 is undoubtedly a master at making you smile. The special touches such as the turquoise sacred cow in reception, or the “love box” awaiting the passionate in their bedrooms, add a sense of fun. Each floor is a continent and coloured accordingly. 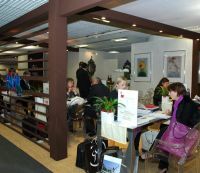 Yet there is nothing lost in comfort, perfect service and attention for its guests. In this writer’s opinion in a world gone crazy for opulence, the Hotel 3.14 perfectly enhances the guests feeling of fun, sensuousness and being cared for, all at once. We’ve already reserved our rooms for next year….